A strong team player and professional with more than twenty years of experience at the Jamaica National Building Society, Horace Hines has served the Society in several capacities, as Supervisor at the Annotto Bay and Port Antonio branches and User Support Officer. He was appointed Money Transfer Network Development Officer at the Jamaica National Building Society in 2003, before transitioning to JN Money Services as Operations Manager. 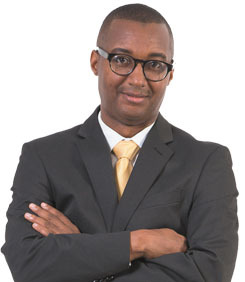 He was part of the project team that led the acquisition of Quik Cash in the Cayman Islands in 2010, and established and managed JN Money Services (Cayman) Ltd. as Country Manager for four years. He was appointed Assistant General Manager of JN Money Services Ltd. in February 2015. His stellar leadership and involvement in successful projects led to his assuming the role of Acting General Manager of the subsidiary in May 2016. Mr. Hines holds a Bachelor of Science in Management and a Masters in Business Administration, both from the Nova Southeastern University. He has received certification in Project Management and Marketing from the Mona School of Business and the University of Technology respectively. He has also completed the Jamaican Securities Course (Jamaican Institute of Management) and Stepping up Management – Knowledge Works (Harvard). Actively involved in the wider community, Horace Hines is a member of the Kingston Cricket Club and former board member of the Building Societies Credit Union. He has served as Staff Director at Jamaica National Building Society and Chairman of the JNBS Sports and Social Club.